Surely we must have adapted to agriculture by now? The answer is no and sort of yes to that question. It depends on what your ancestral heritage is or how long you have been exposed to agriculture. This map shows the distribution of lactose intolerance. Note that the exceptions in the US are Native Americans and African Americans – whose heritage introduced them to dairy very late. If you are Asian, milk is not part of your heritage either. 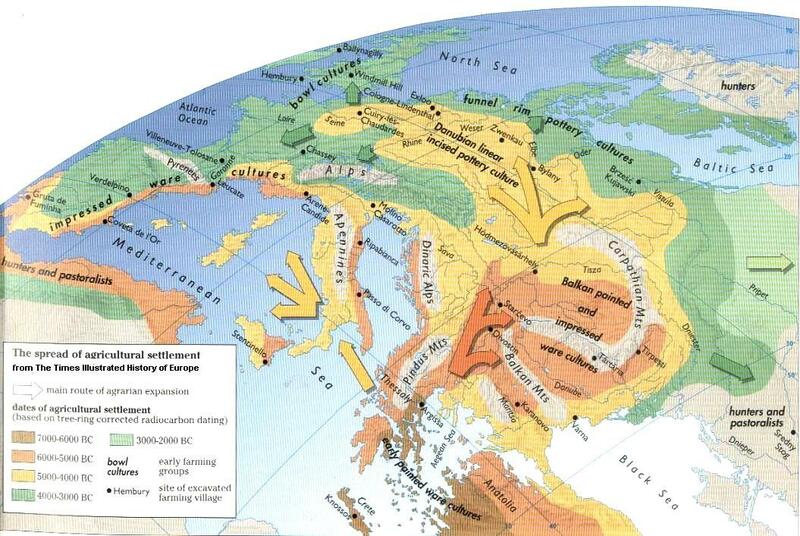 This map shows the spread of agriculture in the west. It’s not that long ago. Evolution takes time to make an impact – if at all. It must have taken a very long time for humans to evolve to eat mainly meat For instance, Chimps love meat but cannot eat much of it. If they do, they get ill. Chimps, like early hominids, have a very large digestive system that is designed to process raw veggies and powerful jaws and teeth designed to chew for hours. About 8 hours a day. It took maybe a million years for our ancestors to adapt to cooked food and meat. As a result they also changed their physiology. We lost 1/3 of our gut and all those big teeth and jaw muscles. If you are from Northern Europe, you will have the best tolerance for dairy. But again, if you live in the US where growth hormone in cows is permitted, you are not drinking even your parents milk. You also will lose this tolerance in middle age. If you are from Northern China, you will have a good tolerance to wheat with all the provisos – if you are from Southern China and Asia you will have a strong tolerance for rice. Again as you age and if you select very processed rice, you will lose this. If you are from Asia and Southern Africa and America you will have a low tolerance for all dairy. If you are from a recent Hunter Gatherer heritage, Inuit – First Nations – you will have no tolerance for Agriculture. None of us have any tolerance for highly processed industrial food. well, I think even raw milk should be taken into account, at the end raw milk does not need the drinker to have the enzymes to digest lactose, there should always be a great division between pastourized and non-pastourized milk, they are two different worlds. Those charts only deal with processed milk, am i correct?. In fact being italian many of my friends are not able to digest processed milk but they are all able to digest raw milk easily, except those of my friends who have an allergy to it, for those i guess there is no way around it. The mammary tissue was consumed repleat with raw milk dripping from the tissues. Wolves & coyotes eat this as well as the partially digested (curdled /fermented) dairy in the stomach’s & intestines of nursing calves.